Hi everyone! 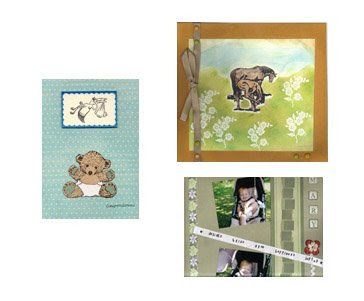 Time for a new challenge, This week's challenge is something really cute, it's 'Babies' - New baby cards, baby scrapbook pages, vintage baby images, whatever ideas you have we can't wait to see them! 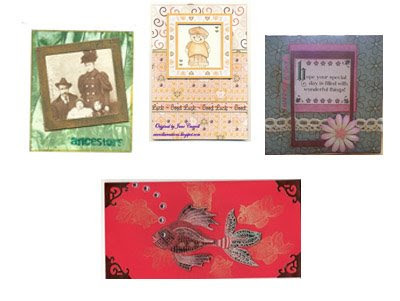 You can make a Card, Tag, ATC, Skinny, Scrapbook page, Fatbook Page (4x4) Gothic Arch, Moo Mini card, Skinny, Inchie or Altered art. 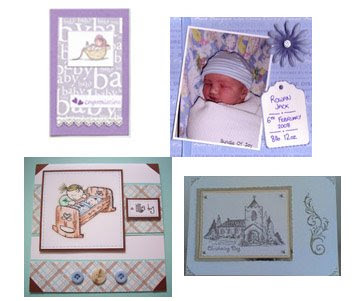 The design team have made some examples below. Please leave us a link to your blog in the comments section. -Congratulations to: Susie Blackwell you have won last week's prize, Please email us your details! 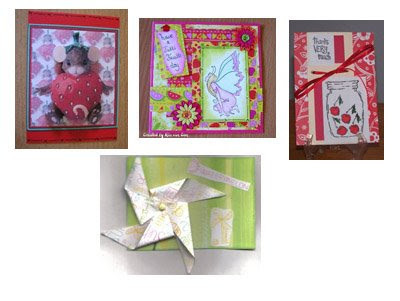 -Also congratulations to the first 10 people who entered last week's challenge: Beth, MardeMoomika, Nessy, Tinkerbell, Tracey, Carolyn, Bubbles, Hilda, Heidi and Denise you will each recieve one of the American craft ribbons. Please email us with your details! 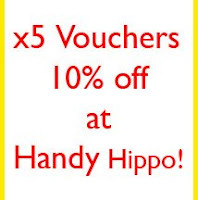 In this week's Prize draw, supplied by Handy Hippo, we have x5 vouchers worth 10% off for their online store! Everyone who takes part in this week's challenge will be entered and 5 names will be picked out of a hat. Good luck. We will announce the winner next week! 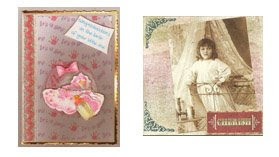 I stamped my 'Angelface' Lily stamp and coloured her in with watercolour pencils, matting her onto pink cardstock and then placed the image on top of some patterned paper. 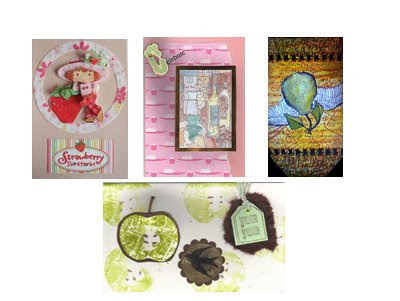 I then added flowers, ribbon, wire, beads, brads and a chipboard sentiment around the image. 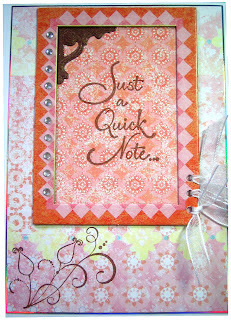 For my card I have used DCWV patterned paper, pink pearlised card embossed with the Cuttlebug Swiss Dots folder, pink satin ribbon, pink gems and a Magnolia Tingla image. The image has been coloured with pens and her top has been paper pieced with the same paper that used for the background. All the paper edges have been distressed with a pink dye ink. 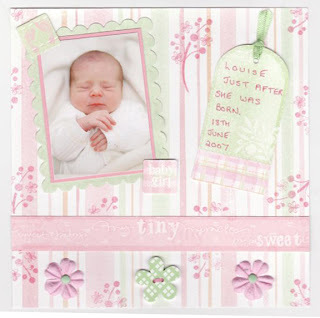 I used a photo of Louise the day she was born, and cut a mat with my Nestabilities on the Big Shot. I journalled on a tag and embellished with some primas and brads, and sewed a gingham button on. The papers are all from Deja Views kit. 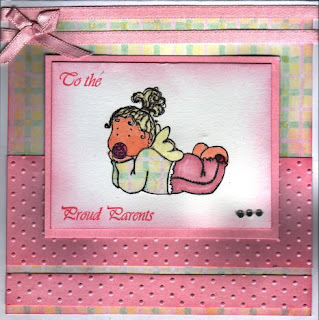 I water coloured my baby Tingla and Alvin stamps, I cut out some pink and blue hearts and doodled around the edges. 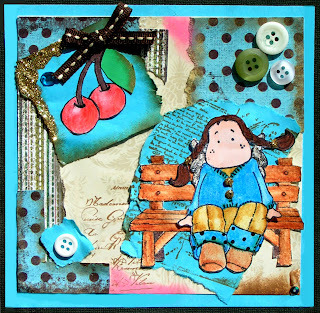 I used pink, blue and beidge cardstock and distressed with ink. 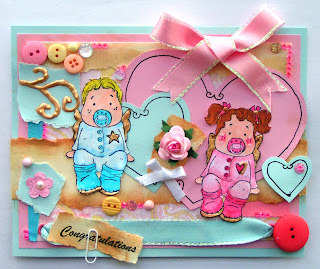 I embellished with lots of buttons, gems, sequins, pink beads, blue and pink ribbon, prima flowers. I added some extra details with gold - ranger liquid pearls. I printed out 'Congratulations' on my computer and distressed with ink, securing with a paper clip. 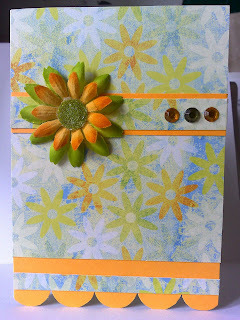 For this weeks challenge I used the free stamp from Craft Stamper this month. I stamped it first on the pink flowery paper with black versafine and then on some handmade paper and cut out the body of the pram. 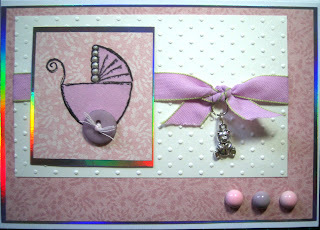 I then used a button for the pramwheel and stitched it onto the card. Some white paper was then embossed with a cuttlebug folder and a ribbon tied around it. 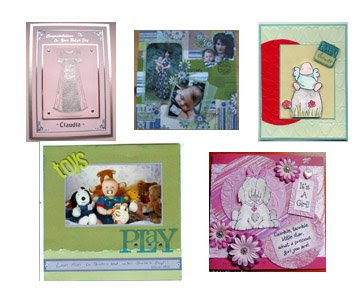 The card was finished off with a teddy bear charm,liquid pearls and three large brads. 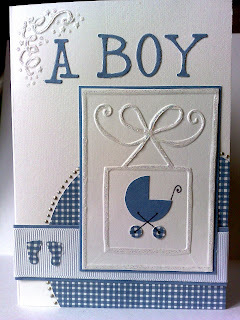 I embossed the bow frame on to white card, cut around it and mounted it onto blue card. I embossed a corner of the base card and highlighted all the embossed detail with clear glitter glue. I drew around a 1p, cut it out, cut a triangle from this to form the pram shape, the wheels were punched out and I hand drew the chassis and the handle with felt pen. I cut a circle out of gingham paper and mounted this onto the bottom corner of the base card and trimmed to fit. I dotted liquid pearls around the edge of the circle. I mounted some white ribbon on to blue card and out of gingham paper punched out the feet and glued to the left edge. I cut out the letters and glued everything in place. Hi everyone! Thankyou for taking part in last week's frame challenge, looks like you had fun with it. 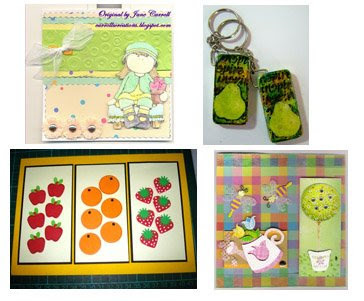 This week's challenge is - 'Tutti Fruitti' Use fruit rubberstamps or pictures, try fruity colours! 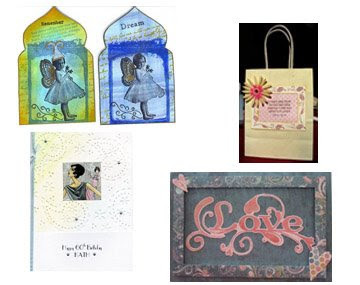 You can make a Card, Tag, ATC, Skinny, Scrapbook page, Fatbook Page (4x4) Gothic Arch, Moo Mini card, Skinny, Inchie or Altered art. Leave us a link to your blog so we can all see what you make. Congratulations to: Rosie you have won last week's prize! Please email us your address! 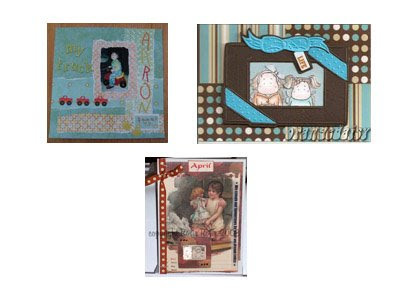 This week's Prize, supplied by Crop Til You Drop, is a huge selection of American Crafts Ribbons. - The first 10 people to take part in this weeks challenge will get one of these beautiful ribbons. - The rest of the ribbons will be up for grabs in our Prize draw. Everyone who takes part in this week's challenge will be entered and a lucky person's name will be picked out of a hat. I covered a card blank with orange paper then covered that with patterned paper leaving a large orange border at the bottom. On the reverse I drew around a 1p several times and cut around this to form the scalloped edge. I added a border to the centre and to the bottom edge. Finally the orange and green flower and co-ordinating gems were added. I used free paper for the background (it was free in a magazine but I can't remember which one!) 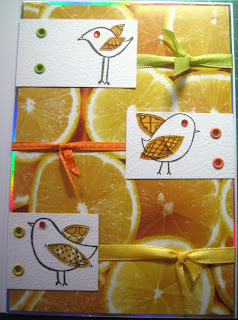 then I stamped hero arts birds onto white card. 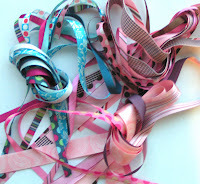 Ribbons in Tutti fruitti colours were added and eyelets in matching colours. A nice bright juicy card!! 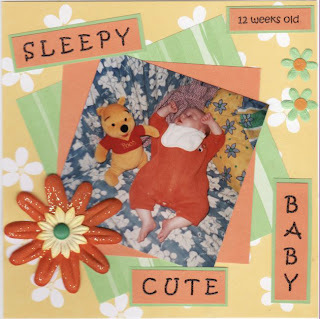 I have used a photo of Georgia when she was 12 weeks old on my LO, and matted it onto Papermania Citrus Papers. I typed some words on the pc and printed them off on the same papers, and embellished with some bright flowers. For my card I followed a technique for the 'Aged Tile' look. 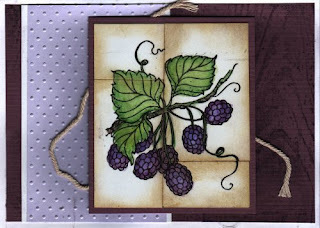 The Blackberry image from Anita's is water coloured. 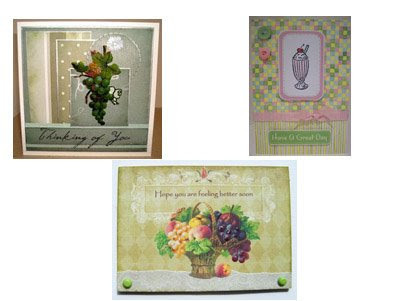 The pieces have been aged with Antique Linen distress ink. This has been mounted onto a background made up of Cuttlebug embossing and a piece of card stamped with a Cornish Heritage Farms tree bark backgrounder stamp. Embellished with string mounted behind the tiled image. 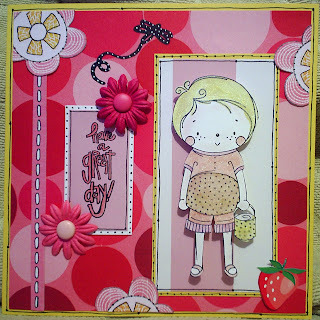 My take on the theme this week was to create a card using Tutti Fruity colours. The stamp is Simon in shorts by Sugar Nellie and I coloured him in with Cosmic shimmer powders diluted in water. I added lots of doodling and a little strawberry to make the card a little more fruity. 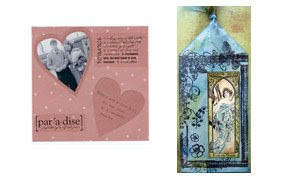 I used papers: Basic Grey Infuse - Invest and 7 gypsies and blue and black cardstock. I distressed the edges of the paper with gold dauber duos and vintage photo distress ink. I watercolored my Tilda stamp and bench and used my paperartsy words stamp. I drew a freehand illustration of some cherries and watercolored them. Embellished with green sequins, buttons, ribbons and gold glitter. Hi Everyone! This week's challenge is: 'Framed'. 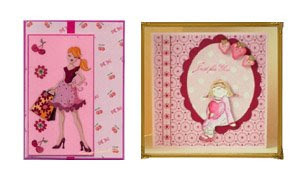 Hand draw a frame, use a die cut frame, cover your frame in flowers or embellishments, make as many frames as you want. 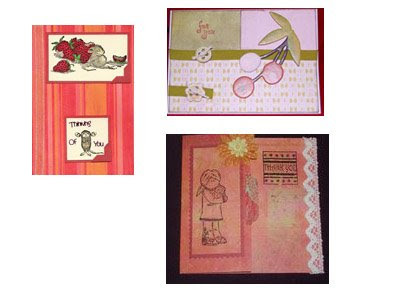 You can make a Card, Tag, ATC, Skinny, Scrapbook page, Fatbook Page (4x4) Gothic Arch, Moo Mini card, Skinny, Inchie or Altered Art. We hope you have loads of fun making your work! This week's prize supplied by Tanda Stamps, is a 10 Medieval Knights Stamp Set'. Everyone that takes part in this week's challenge will be entered into a prize draw and 1 lucky person's name will be picked out of a hat. We will announce the winner next week! 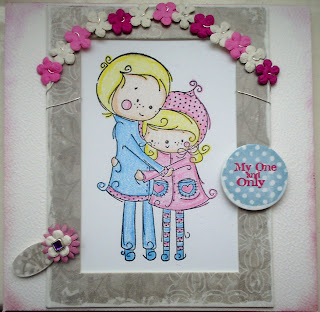 For my card I have printed a Frame from Joanna Sheen's Dancing With Shadows CD and attached it to my card base. I have then stamped my lady which is a Hampton Arts Stamp called 'Pearls and Plumes' onto card stock and coloured paper to paper piece the dress and head band.Once coloured the image has been popped into the frame and I have added sticky back gems to her bracelet, earring and corners. To make my card I stamped Simon and Lola and coloured the image in with pencils. I then threaded some little Prima flowers onto craft wire and wound them around a frame which I placed over the picture. 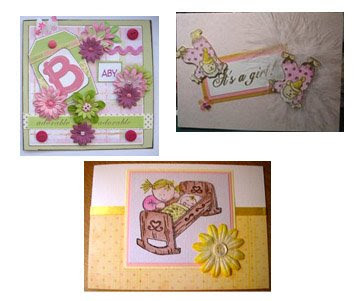 Finally I added some chipboard shapes and chalked around the edges with pink glimmer chalks. I used Basic Grey Infuse - Purify paper & lilac cardstock. I cut out a frame and distressed it with pink, purple and brown ink pads. 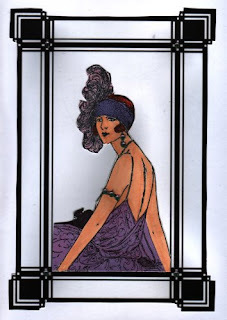 I then cut out a vintage image and coloured the dress with my Petal Point purple ink pad. 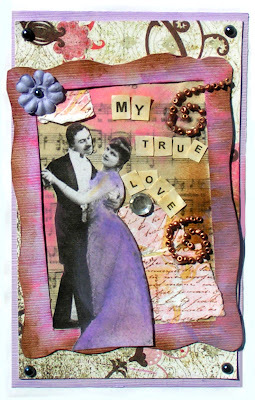 I distressed a music sheet image and used my Paper Artsy words stamp on some pink paper. I stuck on some bronze beads in a swirl shape and printed out some words and coloured them with my chalks. I finished off with a purple flower, and some gems. I used a versamark inkpad to randomly stamp the flowers on to the cream base card. I made the frame by scoring and cutting out a recess in the centre of the card. I stamped the 'friends' image on to cream card with brown ink and then matted and layered this and placed it in the recess. Out of brown card I cut out a flower. 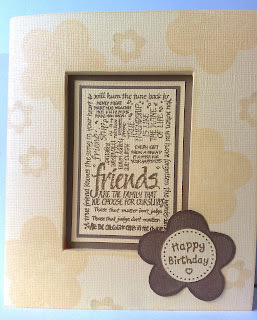 I stamped the message onto cream card with brown ink cut around it and placed it in the centre of the flower. The flower was mounted onto the edge of the recess. The papers and frame I used are from a large Brenda Pinnick kit from QVC. I stamped just a quick note in versafine. I added a photocorner made on my wizard. Ribbon and gems were then added to the frame. 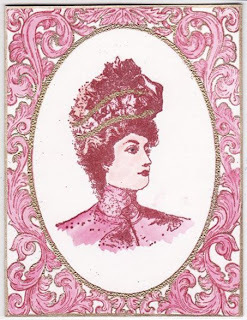 I stamped a frame onto my card with Plum Archival Ink and watercoloured it in with a co-ordinating Marvy Le Plume, and heat embossed round the oval with gold embossing powder. I did the same with the stamped image.